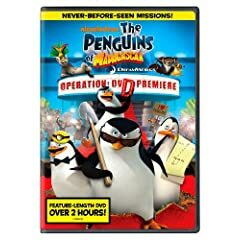 (December 9, 2009) The perennially popular Penguins are back with the world debut of their very first feature-length DVD, THE PENGUINS OF MADAGASCAR Operation: DVD Premiere, taking flight February 9, 2010. Starring the madcap pack of Penguins from DreamWorks Animation’s phenomenally successful MADAGASCAR franchise, Operation: DVD Premiere features never-before-seen missions that continue the MAD-tastic adventure, plus favorite escapades from the highly-rated Nickelodeon series “The Penguins of Madagascar.” The MADAGASCAR franchise has earned over $1 billion at the worldwide box office and the Penguins’ Nickelodeon show was the #1 series premiere ever for the network and was the #1 animated program in October for kids 2-11. THE PENGUINS OF MADAGASCAR Operation: DVD Premiere also includes exclusive access to a brand-new, Penguins-themed online game on Nick.com, a DreamWorks Animation Video Jukebox, and sneak peeks at upcoming DreamWorks Animation and Nickelodeon releases. The DVD arrives just in time for Valentine’s gift giving with a sweet anticipated retail price under $16. The world debut of THE PENGUINS OF MADAGASCAR Operation: DVD Premiere coincides with Nickelodeon’s “Operation Blowhole” tentpole event on February 15, delivering millions of impressions for the Penguins franchise, along with online advertising and promotion and an updated Nick.com/penguins microsite. Additionally, licensed merchandise based on the Penguins franchise will begin arriving on shelves in January. THE PENGUINS OF MADAGASCAR Operation: DVD Premiere is presented in widescreen with Dolby Digital English 5.1 Surround, English 2.0 Surround, French 5.1 Surround and Spanish 2.0 Surround and English, French and Spanish subtitles. The DVD features all-new, never-before-seen missions as well as several favorite penguin adventures. Additional features include exclusive access to Nick.com’s “The Penguins of Madagascar: The Devious Dr. Blowhole” game, as well as special sneak peeks at DreamWorks Animation & Nickelodeon releases. To win a copy of the Penguins of Madagascar: Operation DVD Premiere, all you have to do is tell us the name of the best supporting role for a dad in a motion picture. below. Last date for entries is February 17, 2010.